Our Sixth Form is at the heart of the school community and our provision for students is outstanding. The academic results of the Sixth Form are consistently amongst the best in the country. Our recent Ofsted inspection in November 2016 described the Sixth Form as “excellent”. We combine exceptionally high academic standards with personalised pastoral support to enable all students to be the best they can be. We expect all our students to achieve a strong set of academic grades, but most importantly, we expect our students to leave us as A* people. All our teachers in the Sixth Form have exceptional subject knowledge and a deep understanding of what it takes to succeed. 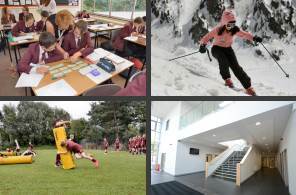 We have an extensive curriculum which enables us to meet the wide range of interests and aspirations our students have. Our students receive bespoke and expert guidance from our highly experienced team of Sixth Form tutors. We have a dedicated Head of Sixth Form who carefully monitors, supports and intervenes to ensure that students achieve the very highest standards. We also have a Head of Year 12 & a Head of Year 13 and dedicated Sixth Form Administrator who oversees pastoral support in the 6th Form and ensures that our students receive excellent care. From the moment a student is accepted at our Sixth Form, they will be part of a programme of support which enables them to develop the study skills required to thrive in the Sixth Form. Students at our Sixth Form are also provided with several opportunities which allow them to gain “the edge” required to be successful in university and job applications. For example, we have a very successful Oxbridge Preparation Programme. As a result of our careful guidance and preparation, we have one of the highest success rates for Oxbridge applicants in Cheshire. Our Sixth Formers also take part in a high quality work experience programme which enables them to develop the skills that are essential for success in the world of work. Our students are provided with high calibre opportunities in a range of competitive industries such as journalism, medicine engineering, business, law and the financial services. We also have extensive links with local businesses which has enabled us to be at the forefront of apprenticeship provision in East Cheshire. Our Sixth Form seeks to develop future leaders. Many students are actively involved in our highly successful Duke of Edinburgh and Young Enterprise schemes. We expect students to continue to develop their talents in music, drama and sport as well as support both the school and wider community through their volunteer work. We are very proud of our strong culture of academic success at Sixth Form. We offer a wide range of courses which enable all students to thrive. Our Sixth Form is a safe and happy place where there is a sense of ambition and pride amongst students. If you want to know more about us, please arrange a visit; we would love to see you.